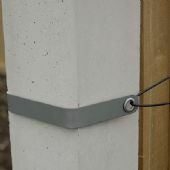 Wire Anchors are a unique product designed by Rivelin Glen Products to fit without drilling to a concrete fence post to act as an eye. It is very difficult to drill concrete fence posts to insert a vine eye, but with these brackets clamped to the post, it makes it possible to run wires to support plants. The Wire Anchors are available in three different sizes and are supplied in packs of either 3 or 6 complete anchors. Other products in the range are Internal Corner, External Corner and End Post anchors. The Wire Anchors are robust and zinc plated for long life and can be used with any wire, cord, or galvanised wire. Add-on items of Fence and Wall brackets fitted with a special bracket behind the anchors make it possible to attach rings, fleece/netting brackets and triple hooks. Used with the Gripple Trellising System system, which is available separately, it makes a quick & efficient job and is highly recommended. Size 0 Wire Anchor - Suitable for post fronts from 75mm to 85mm wide, with a depth of up to 32mm - measure the side, from the front of post to the slot where the timber sits. Size 1 Wire Anchor - Suitable for post fronts from 85mm to 115mm wide, with a depth of up to 32mm - measure the side, from the front of post to the slot where the timber sits. Size 2 Wire Anchor - Suitable for post fronts from 85mm to 115mm wide, with a depth from 32mm & up to 40mm - measure the side, from the front of post to the slot where the timber sits.